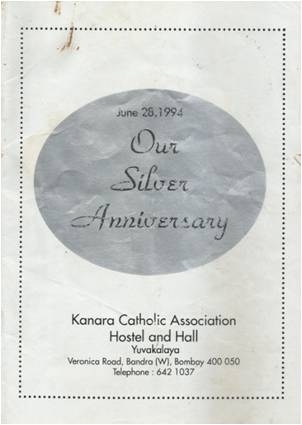 "In 1961, when the Kanara Catholic Association was celebrating its Sixtieth Anniversary, the problem of accommodation for young men coming mainly from the districts of North and South Kanara, to the Metropolis of Bombay on search of jobs, was found to be very acute. The then council took upon itself, with the active participation of all members, the task of addressing this crying need of the time, to start a Diamond Jubilee fund with the objective of constructing a Hostel and a community Hall - it was aptly given the name "Yuvakalaya" (Abode for the Youth). The response was very encouraging and within a short while an active collection drive was started, and a plot of land acquired. Plans for a building were drawn up, permissions and approvals obtained and the foundation stone was laid in 1963"